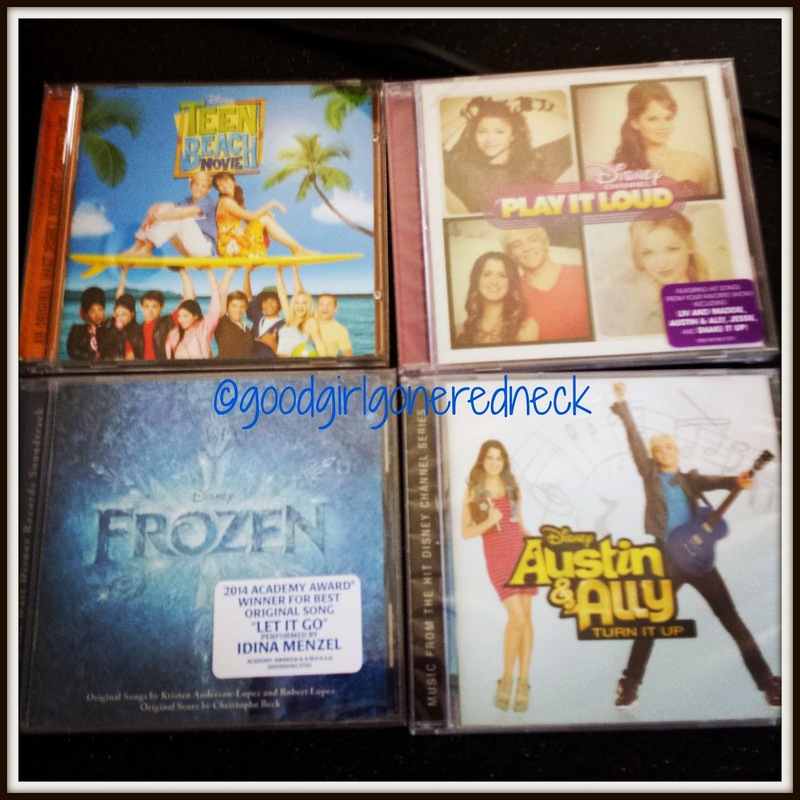 Good Girl Gone Redneck: Sing into Spring with Disney Records! Sing into Spring with Disney Records! It's time to SING INTO SPRING with Walt Disney Records!!! Join me today as I invite you to learn about the four CDs I received to review for you all. Take a look! My daughter and I have been bopping around my kitchen to the soundtrack of Teen Beach Movie all morning. It helps that she has seen the movie a good handful of times and we have it on our DVR as I write this. I'm pretty sure we'll be watching it again tonight now that she's motivated into the mood with the music in the background of our day. Our second CD in this gift-pack is Disney's Play It Loud. With music by Zendaya (of Shake It Up), Debby Ryan (Jessie) and China Anne McClain (ANT Farm), your kids are going to love this. Seriously. It might be on repeat wayyyy too many times - but hey, at least it's kid-friendly lyrics, right? We've also got a copy of Austin and Ally: Turn it Up for you. With thirteen songs the cast kicks it up a notch and I have to admit, the music is pretty catchy. It's the kind you find yourself singing along with after a while and forget it's a "kids' CD" ... for a little while, at least. And then of course, let's talk FROZEN. I mean, what is there to say? If you haven't seen the movie yet - well - you really must. But if you haven't heard any of the songs yet, I must ask you - where have you been hiding? This CD is one of the top selling CDs right now. The music won an Academy Award for goodness' sake. Or maybe two. Who knows? But really - if you and your kids don't know pretty much every song by heart you need to enter this giveaway. STAT. I'm also lucky enough to give away the Preschool Sing into Spring 4-pack to one lucky reader. This bundle consists of the Doc McStuffins Soundtrack, Jake and the Neverland Pirates - Yo Ho Matey CD, DJ Shuffle (which I kind of want for myself because it's got a mix of Sofia the First, Jake, Doc, Mickey Mouse Clubhouse and more) and last, but never least, FROZEN. YES. This means that BOTH winners will be receiving a copy of the FROZEN soundtrack. What more could you want? Click through my Rafflecopter below and find yourself a way to enter. I promise to make it as easy as possible for you. And if you want to purchase any of these CDs on your own, I've got the links throughout the post for you to go shopping. Happy listening! Preschool Disney all the way! You know Keira is all about her Disney tween music!! My girls would love the tween set! We want the preschool one! (well.. mommy wants the preschool one since she doesnt' want to accept the fact she may soon have tween girls!) ACK! I want the one with Frozen. We'd love to win the tween one for my nieces :) THANKS!!! We would love the preschool one! My kids would LOVE the preschool pack! My daughter would be super excited about the tween pack. We would love to receive the tween pack! We'd love the Preschool Pack! Who doesn't love Frozen!! The preschool pack would be a big hit here! I would love to have the tween 4-pack for my granddaughter's. My daughter would love the preschool set. I would LOVE to win the Preschool pack for my 4-year-old. My olders would love the tween but DD would love the preschool one.....hmmmm. I suppose I will pick the tween. I'd love the preschool pack! I'm afraid my CD of Frozen will wear out from repeated playing.